BEACON — It's been three months since we began our $8.5-million park improvement project on the Beacon waterfront. 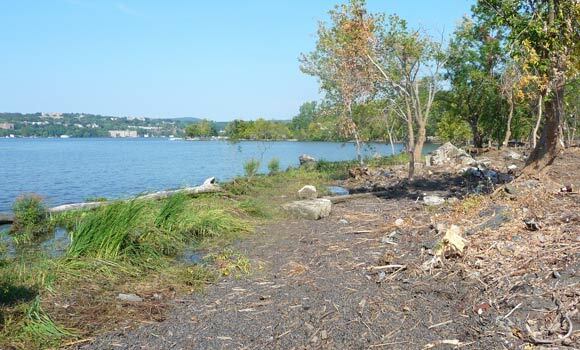 When the site reopens in spring 2011, Scenic Hudson's Long Dock Park will include a kayaking center, a restored barn — Scenic Hudson’s River Center — for environmental and arts programs and rehabilitated wetlands and meadows. This project would not be possible without investment by generous organizations and individuals. Support has come from New York State Empire State Development Corporation, NYS Department of State Division of Coastal Resources, The Peter Jay Sharp Foundation, NYS Senator Stephen Saland, Dormitory Authority of the State of New York, NYS Office of Parks, Recreation and Historic Preservation, The Charina Endowment Fund, Hudson River Estuary Program of the NYS Department of Environmental Conservation, Dutchess County Industrial Development Agency, and Jane W. Nuhn Charitable Trust. Additional support has been provided by Central Hudson Gas & Electric and Benjamin Moore & Co. Historic uses of the areas around the Red Barn at Long Dock included a rail yard and commercial ferry landing, salvage/scrap yard, major oil storage facility (MOSF), pesticide and herbicide manufacturing and other industrial uses. Prior to the start of construction, testing indicated that the soils were contaminated by metals (primarily arsenic and lead), PCBs, and oil residues in these areas. 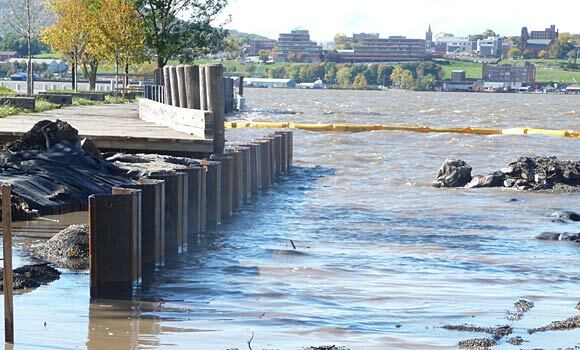 Scenic Hudson voluntarily entered NYS Department of Environmental Conservation's Brownfield Remediation Program to remove the contaminated soils from the site in our work to develop Long Dock Park. The remediation work involved excavating the contaminated soils to the required depths, extensive testing to ensure that all contaminants had been removed, and transportation off site to an approved repository. 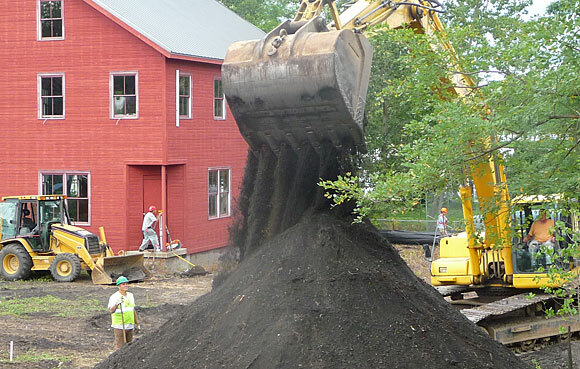 In all approximately 350 tons of contaminated soils were removed. Before backfilling the area with certified clean fill, a demarcation layer was installed at the bottom of the excavations to indicate the depth of remediation work to any future contractors. Left dormant and unmanaged for many years following its industrial past, the depleted soils and disturbed acreage at Long Dock became an ideal home for "invasive" plants. These plants—mugwort, Norway maple, Japanese knotweed, and phragmites, among others—are uniquely adapted to colonize such disturbed landscapes. The invasive plants out-compete native plants that local wildlife depend on for food and shelter. A major goal of the park design focuses on habitat restoration by removing the invasive species and reestablishing native plants in their appropriate habitats. The vast majority of the invasive species were removed during fall 2010. However, some removal work remains before the native plants are installed in 2011. In addition to chemical contamination and invasive species, much of the wetlands on the site have been depleted by physical pollution and fill placed on the property over the years. The work to create the park includes completely restoring these wetlands by excavating them to appropriate depths and replanting them with appropriate wetland soils and plants. 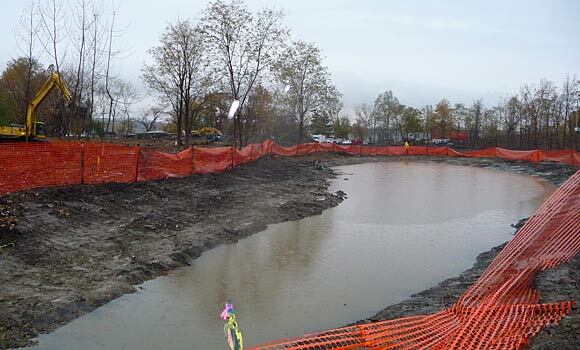 Thus far, one of the restored wetlands has been excavated to its "rough grade" and will be brought to "finish grade" in the spring by the addition of the appropriate custom-blended wetland soils. During the work contractors encountered significant amounts of large debris below the surface, including enormous concrete chunks, boulders, old railroad ties and sections of rail. A relic of its days as a major shipping dock, the timber bulkheading that prevented the river from eroding the shoreline had deteriorated badly. Before a new shoreline and canoe and kayak launch beach could be created, the timber bulkhead had to be replaced with 3/8"-thick steel bulkheading. These steel sections were driven to a depth of 15 feet using a 4-ton vibratory hammer and can withstand incredible amounts of lateral pressure, which will ensure that the shoreline and beach areas remain intact. For those familiar with this area before construction, the shoreline and adjacent areas were covered with concrete slabs at least three-deep that came from the Newburgh-Beacon Bridge when it was widened in the mid-to-late 1970's. Growing amongst the crevices of the slabs was a tangled mass of invasive trees, plants and poison ivy vines. This fall, contractors removed and stockpiled the slabs for reuse in parking areas and restored this section of shoreline to a beautiful natural stone beach that will become the home of the kayak and canoe pavilion and launch area. 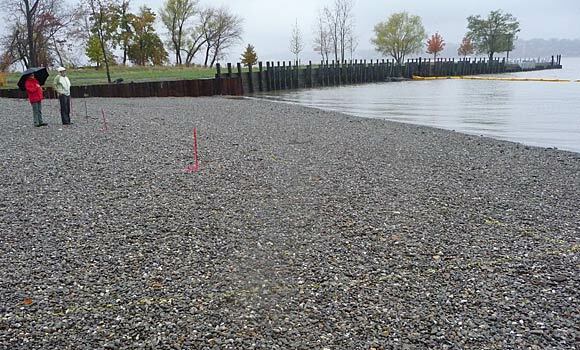 The shoreline of the Hudson River at Long Dock has received the same harsh treatment from historic uses as other parts of the site. An artificial berm was constructed to prevent the Hudson from flooding the site during its days as a rail yard and nearly every conceivable type of fill was used to create the land here. 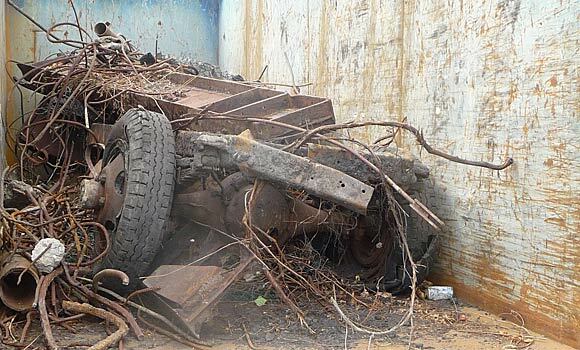 To create safe public access to this most majestic section of the Hudson, with iconic views to the Hudson Highlands, contractors removed several 30-cubic-yard containers of assorted metals -- including an old truck chassis -- as well as over a 100 cubic yards of the flotsam and jetsam accumulated from decades of Hudson River tempests. Currently the south shoreline has been freed from the menacing vines, hazard trees and debris that kept would-be admirers at bay. These tranquil areas along the bay will be home to riverside seating that will feature benches made from driftwood "volunteers" that, whether by storm or quiet meander, came to make this shoreline their home. The transformation of the Red Barn into Scenic Hudson's River Center presented the design team with a unique set of challenges. Since the land upon which it rests comprises fill and "made land," it is difficult to know how the building will behave with the added weight of an elevator, new decking and fill material in the basement. Additionally, the building sits just above the elevation of the 100-year flood. To compensate for the additional weight placed around the building and the differences in where the added weight is concentrated, the designers called for lightweight fill to be used in the basement and in the areas around the foundation where the remediation will be back filled. This fall contractors have installed the foundation for the elevator shaft and have begun building the shaft itself. Work also has begun on insulating the structure and new framing. 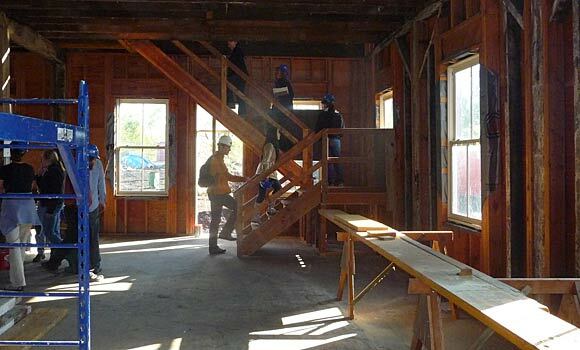 When the Red Barn is complete, the nonprofit group Mill Street Loft will establish a multi-arts, environmentally themed community educational center in the facility. Amenities in and around the Red Barn will allow Mill Street Loft to expand its already successful art-based programs. The organization plans year-round events, exhibits, classes and workshops, engaging the community, including at-risk youth. Scenic Hudson also will run environmental education and other community-based programs from our Red Barn.